Leifeng Pagoda is an octagonal five-story tall tower with historical stories and interesting legends going along all the time. 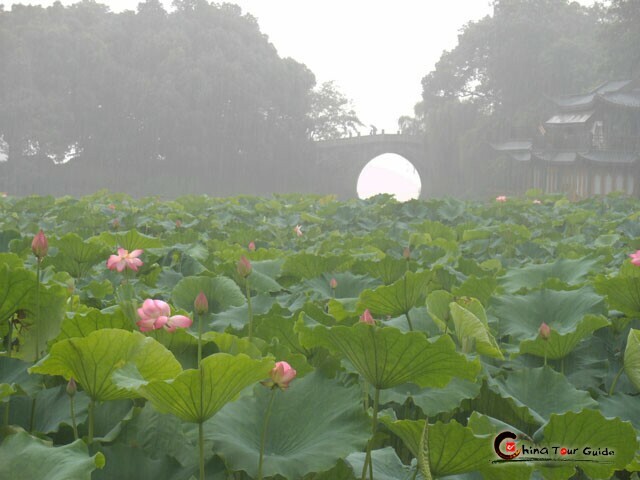 It is located on Sunset Hill south of the West Lake in Hangzhou. Originally constructed in the year 975 AD, it collapsed in 1924 but was rebuilt in 2002, since when it has been a popular tourist attraction. 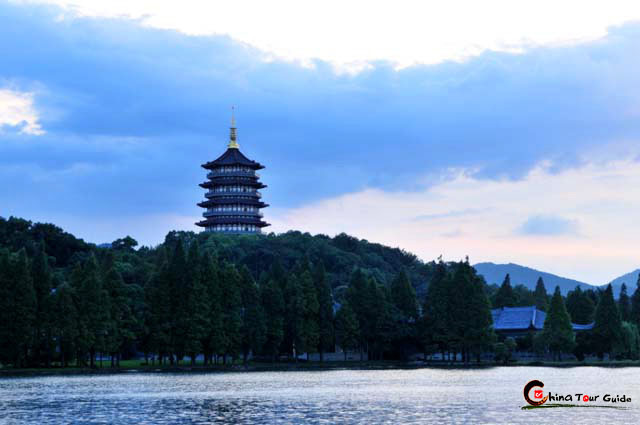 The original pagoda was built in 975 AD at the order of a King to celebrate the birth of his son by one of his favorite concubines, Huangfei. 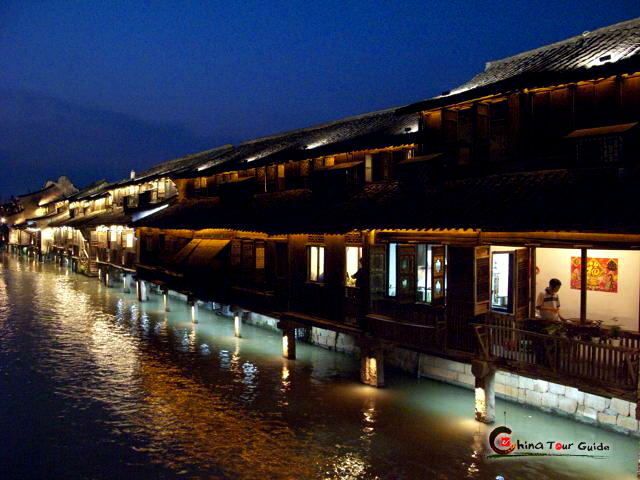 It was therefore called Huangfei Pagoda at that time. During the Ming dynasty, Japanese pirates attacked Hangzhou. 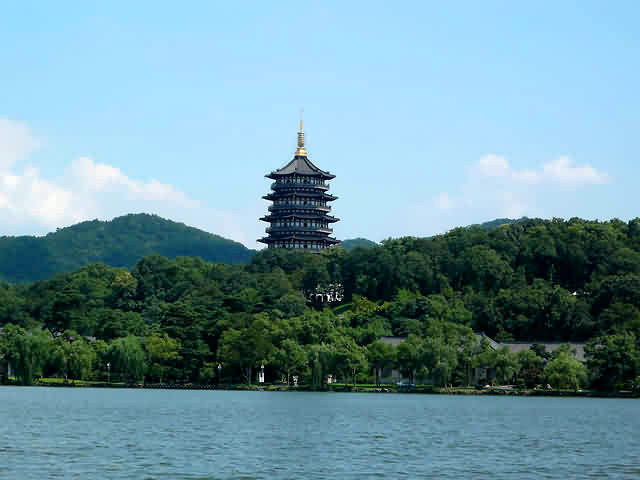 Suspecting the pagoda contained weapons, they burned its wooden elements, leaving only the brick skeleton, as can be seen from Ming paintings of the West Lake. 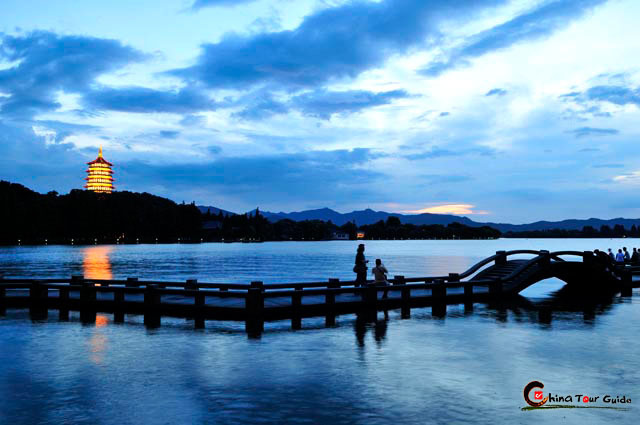 Leifeng Pagoda was one of the ten sights of the West Lake because of the Legend of the White Snake. At its most basic, the story tells of a young scholar who falls in love with a beautiful woman, unaware that she is a white snake who has taken on human form. A monk intervenes in order to save the scholar's soul and casts the white snake into a deep well at the Lei Feng Pagoda. Over centuries the story has evolved from horror story to romance with the scholar and the white snake-woman genuinely in love with one another, but such a relationship is forbidden by the laws of Heaven. The legend was existed as oral traditions long before any written compilation. It has since become a major subject of several Chinese opera, films and TV series. As for whether there was a mausoleum below, this was debated for years until finally radar was used to investigate. On March 11, 2001 the mausoleum was excavated and many treasures were found, most notably a gold and silver coated hair of the Buddha.